Stefani Wurts Skrovan has been working as a marine animal trainer since 1990. She received her Bachelor’s degree in Marine Biology from University of California, Santa Cruz in 1993. Stefani began volunteering at Long Marine Laboratory as an undergraduate, and after graduating she was hired on as full time staff. 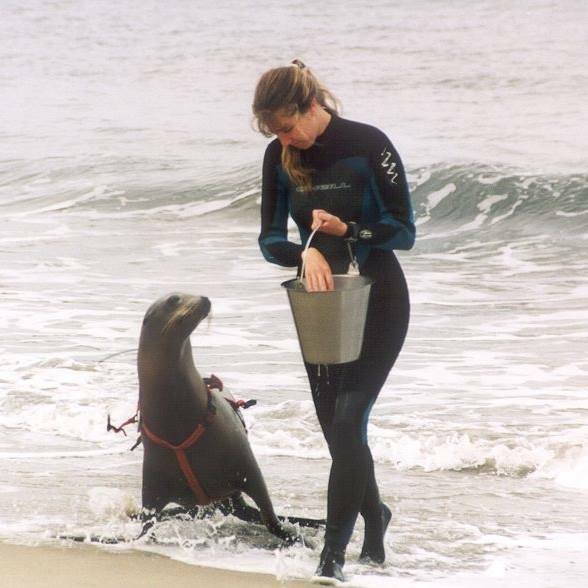 Throughout the years she has worked with sea lions, bottlenose dolphins, seals and parrots. She moved to Moss Landing Marine Labs with the SLEWTHS project, first as a senior trainer, and later as head trainer, and now as Curator of Animals, helping to build the new facility in 1998. As the Curator of Animals, Stefani is active in helping design and implement all facets of SLEWTHS, including animals, staff, facility and educational programs. Stefani has been a professional member of the International Marine Animal Trainers Association (IMATA) since 1993 and the Marine Mammal Society since 1999. She has helped prepare and give numerous professional presentations, including award-winning presentations in both formal and poster categories. Stefani looks forward to continuing her career working with animals of all types on the cutting edge of animal behavior and research.